How long you can leave your fish without food depends on their health, fat reserves and water temperatures. The fat reserves of your fish will always be high if they are being fed adequately. If fish are being underfed, or fed poor quality food, their fat reserves won’t be high enough for an extended period of starvation. Judging from images posted on Facebook, I estimate 1/3rd to ½ of all Goldfish are underfed. 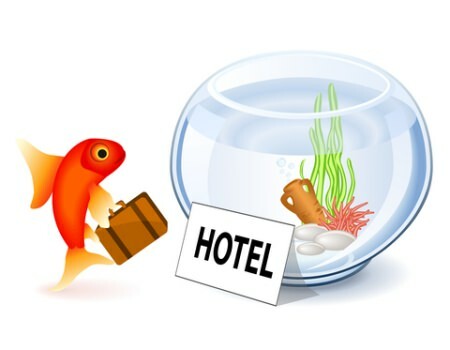 If you are taking holidays during winter, and depending where in the world you are living, your Goldfish should be in a low state of activity. At the extreme end of winter water temperatures, say below 10C (50F), your Goldfish aren’t interested in food at all, so they can be safely left for several weeks without being fed. At temperatures between 10-15C your fish should easily cope with no feeding for two weeks. For temperatures above 15C, how long your fish can cope with no feeding depends on their general health, size and fat reserves. Up to 20C (68F), Goldfish in excellent condition will cope with not being fed for two weeks. Fish under 12 months old shouldn’t be subjected to any form of starvation as this is their period of fastest growth. Any breeding plans for the season should be put off until you return. Edible water plants such as Elodea Crispa and Elodea Canadensis are a good source of food but make sure they are sterilized. Water plants sourced from natural waterways can carry lice, and pet shop sourced plants can carry any number of diseases. Automatic feeders are an option, but they aren’t suited for gel foods, only dry. Some aren’t the most reliable, either delivering too much or too little food. The food can also go stale being exposed to the atmosphere. Some feeders have fans to try and keep the food fresher. If feeding gel foods, changing to a dry food for the holiday period isn’t worth the risk of causing digestive problems, especially in fancy varieties. Clean out filters a day or two before going on holiday. Even though there may not be anything going into the water that will create ammonia from waste, a clean filter will be able to handle an unexpected death better than a clogged one. Make large Water changes for the same reason, but not pond water if the water temperatures are low and the fish are in a dormant or semi-dormant state. If possible, a sick bay should be set up with a simple foam filter and a small amount of salt added a few weeks before the holiday so it has time to establish. Any fish showing signs of illness should be moved into the sick bay. To help avoid a disease outbreak keep water parameters perfect for some weeks leading up to your holiday because if one fish starts to show signs of illness, it is a sure bet all of them may be about to develop something. Use neighbors sparingly. One of the greatest dangers to Goldfish is the well-meaning neighbor or relative who is easily seduced by Goldfish begging for food. Write down instructions and give a demonstration on how to feed the fish. Package food in the appropriate sized amounts for each feeding. Reduce the feeding frequency to lessen the burden on your neighbor. Make a List of possible emergencies such as the filter stopping or leaking, dead fish, water temperature drop or water quality issues and what to do about each. Equipment such as nets, tongs, hoses and spare containers should all be accessible. With the modern communication devices available today, unless you are going “off the grid”, contact should be possible in an emergency. For short periods of up to two weeks, it is often safer to leave your fish un-fed. If you do have someone feed your fish, provide written instructions, and give a demonstration of what is required. Make water changes and clean out filters just prior to your holiday, but also make frequent water changes leading up to your holiday.